"Among the Columns of Thor" has a double meaning to it. In Norse mythology, Thor is the god of thunder and war. These B-24 bombers from the 409th Squadron, 93rd Bomb group, are in column formation, literally flying among Thor's cloud columns as they return from their targets deep in Germany. 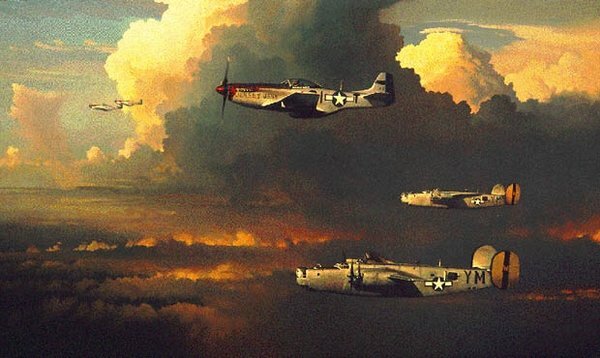 They are escorted by P-51 fighters of the 3361st Fighter Squadron, 356th Fighter Group. The paint scheme on the engine cowling of "Jersey Jerk," Donald Strait's plane, was designed by Freddie Schlack, another young pilot in the squadron. That pattern became the official scheme for the entire fighter group. Squadrons within the group would use different colored rudders to identify themselves. The deep, ominous colors at the right of the image represent war, whereas the left side is painted with lighter colors, signifying peace. The silver color scheme of the planes can also represent Allied superiority and the coming end of the war. Naturally, the aircraft are flying from the darkness into the light. Edwin C. Baker, pilot, 409th Bomb Squadron.